10 years ago in aviation now seems like an eternity. The numerous airline mergers and acquisitions, new aircraft models released, security regulations imposed, and various other incidents have seemed to clear our memory of one of the most tragic Pre-9/11 air crashes. I’m writing about this rather unusual topic because today, July 25th, 2010 is exactly 10 years from the day when the Air France Concorde crashed on takeoff outside Paris Charles de Gaulle Airport. While the crash of the supersonic airliner that could fly at twice the speed of sound has faded into the distant past of most flyers today, it’s an event that remains vivid in my memory. As a 7-year old visiting Europe for the first time, I didn’t fully understand the enormous distance separating the two continents but I did understand how we were going to get home on that hot summer afternoon in Paris. Let me explain. My family was about to return home from a two-week vacation visiting the highlights of southern England and northern France, and we had already endured a lengthy 7 hour flight from Newark – London on the powerful wide-body DC-10 airplane. I remember jokingly discussing the possibility of using frequent flier miles to pay for the quick but expensive trip home on the Concorde, but those thoughts vanished. In hopes of a bit more entertainment for the flight home, my older brother researched the aircraft that was scheduled to fly us home from Paris. 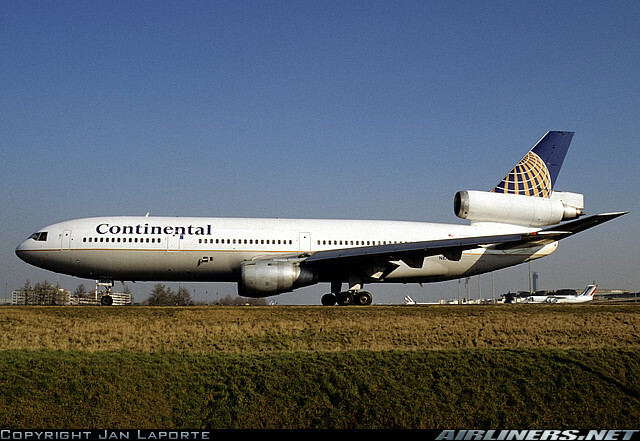 The originally scheduled aircraft that was supposed to operate the flight was the brand new 777-200 aircraft which had just been delivered to Continental only a couple months earlier at the turn of the century. The entertaining advantage on the 777 was that everyone on the plane would have their own television to watch movies and play games, a concept that revolutionized in-flight entertainment 10 years ago. To our disappointment the Continental aircraft that was waiting at the gate to take us back home was a DC-10. The equipment swap which took place in Newark a day earlier eventually turned out to be the source of crash which was according to investigators, the result of a titanium strip falling off the DC-10 onto the runway. After several years of investigation, French authorities concluded that a piece of titanium metal fell off the Continental plane which my family was flying home on, and then the metal caused the tire on the Concorde to explode. 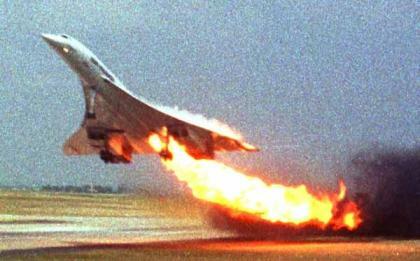 Once the tire exploded, the pieces of tire were ingested, which immediately started a fire in the Concorde’s engines, leaving the Concorde with no thrust and a tragic crash resulted. My most striking memory is when we taxied to the runway past the Air France Concorde that day, I remember seeing the passengers climb the stairs from the tarmac onto the plane, self assured that they would be safe and sound in New York just 3 hours later. When my family did arrive safely 8 hours later at Newark Airport on-board the Continental DC-10, we learned about the crash and were completely confused and astonished knowing that such a tragic event had happened just minutes after we left France. In total, 109 passengers died on-board and 4 others on the ground. The crash also lead to the eventual end of the Concorde service as new maintenance requirements became too expensive for Air France and British Airways, combined with reduced passenger traffic due to the 9/11 attacks. Today a ceremony in Paris was held to honor the victims of the crash at the crash site in Gonesse, France. The two Continental mechanics who were responsible for installing the titanium strip are currently under manslaughter charges, and the ruling on the case will be determined in December later this year. Concorde was an excursion charter, not headed to NY. oops, never mind, it was an excursion charter headed to NY, according to Wikipedia. I recalled it wasn’t a regular scheduled flight, didn’t realize it was going to NY. Oh how time flies. I miss the concorde. Yes, you’re right it was a charter to NY. Although seeing that the flight was a charter it explains why I saw the passengers climbing stairs to board the flight on the apron rather than through a conventional gate closer to the terminal. The entertaining advantage on the 777 was that everyone on the plane would have their own television to watch movies and play games, a concept that revolutionized in-flight entertainment 10 years ago. Um, it was closer to 20 years ago when it revolutionised in-flight entertainment for Singapore Airlines, Swissair and so on. Perhaps you mean for US travellers on US airlines? Unfortunately I believe that you are misunderstanding the in-flight entertainment described in my post. While the first personal LCD TV’s in each seat were introduced about 20 years ago, they were simply monitors projecting movies in replacement of CRT/projector TV’s. The revolutionary in-flight entertainment that I am referring to is known as AVOD (Audio/Video On Demand), which was first released by Panasonic for installation in aircraft in 1998. The first Continental 777’s were delivered in the same year with personal TV’s equipped with AVOD 1.0.